There are 7 Memory Care Facilities in the Mobile area, with 6 in Mobile and 1 nearby. The average cost of memory care in Mobile is $4,698 per month. This is higher than the national median of $4,650. To help you with your search, browse the 1 review below for memory care facilities in Mobile. Better rated regions include Spanish Fort with an average rating of 2.0 out of 5 stars. Caring.com has helped thousands of families find high-quality senior care. To speak with one of our Family Advisors about memory care options and costs in Mobile, call (855) 863-8283. Seniors age 65 and older make up approximately 15 percent of Mobile, Alabama’s population, 192,904 at the last U.S. Census count in 2010. Some of these seniors are part of the state’s 92,000 people who are living with Alzheimer’s disease, and to serve them, Mobile has nine memory care facilities. Five facilities are located within the Mobile city limits, and four more are located in nearby communities. In Mobile, and the rest of Alabama, memory care facilities are commonly referred to as specialty care assisted living facilities. They are licensed and regulated by the Alabama Department of Public Health, Bureau of Health Provider Standards, and specialty care assisted living facilities are required to maintain additional certifications, ensuring they have the ability and resources to provide the right type of care to residents. Alabama is a tax-friendly state for seniors. While the state has a 5 percent income tax rate, Social Security payments, pension payments, and retirement account withdrawals are completely tax free. This allows seniors to keep more of their money, which can be put toward the costs of residing in a memory care facility. The overall cost of living in Mobile is slightly higher than the state average, but it’s 9 percent lower than the national average. This means even though the cost of groceries and health care services may be a bit higher than they are in other parts of Alabama, they should still be affordable enough — even for seniors on a low or fixed income. Mobile seniors can enjoy the city’s year-round warm weather. In August, highs can reach 82 degrees Fahrenheit, on average. The lowest average monthly temperature occurs in January when it can get down to 52 degrees Fahrenheit. These moderate temps make it easy for seniors to enjoy outdoor activities throughout the year. Mobile’s overall crime rate is 78 percent higher than Alabama’s average and 126 percent higher than the national average. Because of this, seniors and their loved ones may be a bit concerned about safety. Fortunately, memory care facilities in the state are required to have added security for memory care units, so it’s unlikely residents will become a victim of a crime. Memory Care costs in Mobile start around $4,698 per month on average, while the nationwide average cost of memory care is $4,799 per month. It’s important to note that memory care rates in Mobile and the surrounding suburbs can vary widely based on factors such as location, the level of care needed, apartment size and the types of amenities offered at each community. 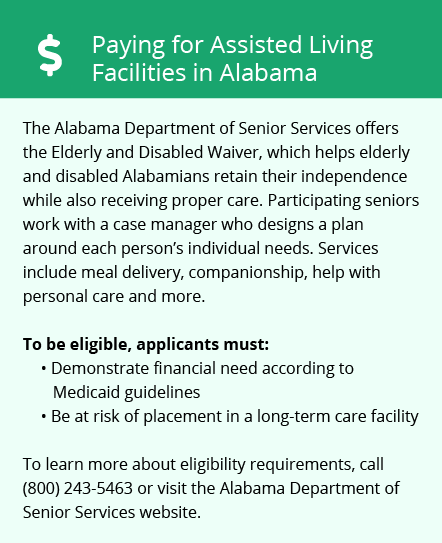 Mobile and the surrounding area are home to numerous government agencies and non-profit organizations offering help for seniors searching for or currently residing in an assisted living community. These organizations can also provide assistance in a number of other eldercare services such as geriatric care management, elder law advice, estate planning, finding home care and health and wellness programs. To see a list of free memory care resources in Mobile, please visit our Assisted Living in Alabama page. 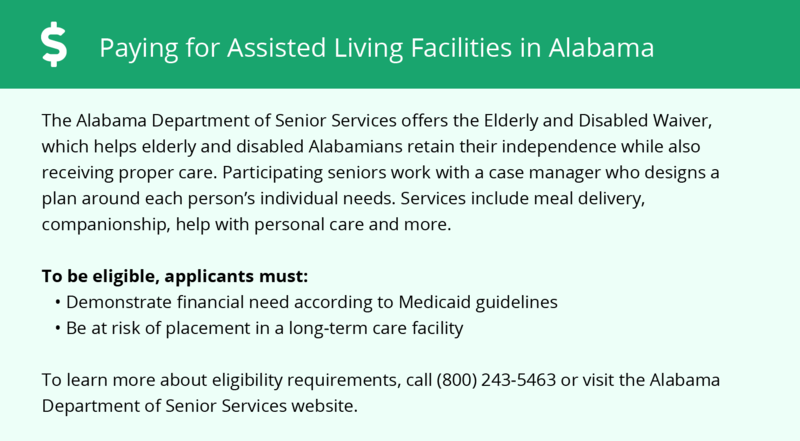 Mobile-area assisted living communities must adhere to the comprehensive set of state laws and regulations that all assisted living communities in Alabama are required to follow. Visit our Memory Care in Alabama page for more information about these laws.